3 Bedroom Semi Detached House For Sale in Sheffield for £115,000. 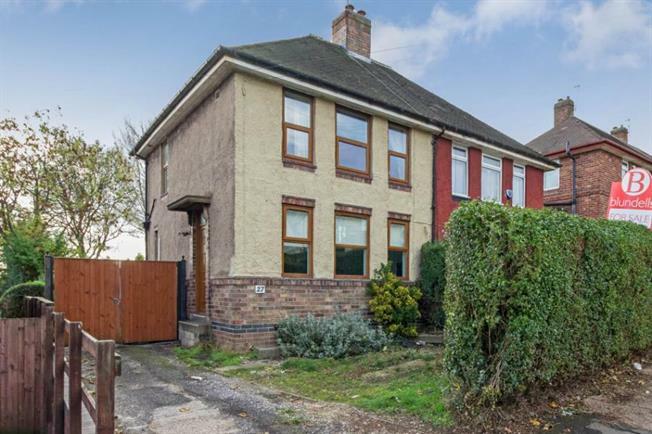 An early viewing is essential to take advantage of this three bedroomed semi detached home, located in the heart of this popular and convenient suburb. Of possible interest to the owner occupier or Landlord alike, the property offers spacious accommodation over two levels with the benefit of double glazing, GCH, gated driveway, garage and rear garden. Ideally located for excellent amenities including local shops and supermarkets, schooling, public transport links, retail park at Wadsley Bridge, road network to motorways, walks in nearby countryside at Birley Edge and Grenoside woods. With further amenities in nearby Hillsborough including shopping and leisure centre. The accommodation comprises an entrance hallway. A spacious lounge with open fire focal point and three windows to the front. The kitchen has an excellent range of base and wall units with Belfast style sink and space for range oven with extractor hood above. A conservatory provides further accommodation with French doors opening to the garden. With rear lobby, downstairs WC and useful walk in cupboard. On the first floor, the Master bedroom has a pair of windows to the front and is carpeted, Double bedroom two has window to the rear with wood effect flooring, Bedroom three offers flexible accommodation as third bedroom, nursery or study. The bathroom has modern three piece suite in white comprising WC, wash basin and bath with shower over and screen with Travertine effect tiling. To the exterior of the property is a driveway and forecourt, a gate opens to further parking leading to the garage. To the rear is spacious garden area with lawn providing an excellent outdoor seating, play and entertaining area.